Issue 20 of The Nightwatchman is out now and available to buy here. 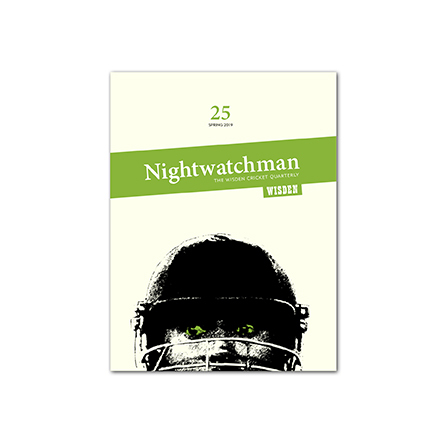 The 20th issue of the Nightwatchman represents a full five years of writing around and about cricket, comprising some 400 essays by 240 different writers and totalling a million words (give or take). Among our ever-expanding stable of writers we can count librarians, paleontologists, prime ministers, poets, historians, priests, novelists, mathematicians, professors, stand-up comedians, parliamentary sketch-writers, economists, rock stars, teachers, TV and film producers, Wisden Almanack editors and international cricketers past and present. Our church is a broad one. And we’re mightily proud that pieces between these covers have spawned four books, two of them prize-winning. This issue is no different in terms of range of writer and subject. With the Ashes well under way, we major on Australia, stopping off in the barren countryside where so many Aussies learned to play the game, and in Melbourne where Jarrod Kimber talks us thorough his cricket-obsessed childhood, as well as taking a look at prejudice in Australian cricket of the 1970s and ’80s. We also touch down in South Africa, from where Luke Alfred updates us on the stuttering progress of the country’s proposed T20 league, and to complete our round-the-world trip, Alex Massie shows us a region of Pakistan just ten miles from the Afghan border. Our photo section reinforces the theme of travel, detailing how players used to cross the world for the Ashes in the first half of the last century.